ASPIRING MUMMY BLOGGER| #1 | Merin and Co.
What do you want to be when you grow up? It’s a question we ask children all the time. When I grow up I want to be a Mummy Blogger. These ladies that are given stick in newspapers for talking about their gin consumption, being a bit sweary and wanting to run away from their kids? Yep, that’s what I’m aiming for. I’ve got the first bit down, now time to up my game on the second! The aforementioned ladies work exceptionally hard to create something for themselves and their families. Also, although they’ll freely admit that becoming a parent has changed them, they haven’t lost who they are either. I want to be able to say the same as well. Whether it is my competitive nature or my millennial mind, I’m not sure. I just know that I want to leave this planet knowing I’ve given it my all to create something good, stable and flexible that works for my family and I. Importantly, I want to create something to call my own. If doing it allows me to spend more time with my family in the future, then even better. Now those of you who know me know that I am a teacher. I hear you say, “But you already get 12 weeks holiday, what more do you want?” That is a question I can’t quite give a specific answer to. However, more is the answer. I just want more. I believe that Mummy Blogging will give me the opportunity to explore a new avenue of myself, to use skills I don’t get to use on a daily basis and to develop new ones I haven’t used before. Something else I know is that I want is to be able to manage my own time more and be involved in more varied projects. This is something I feel becoming a Mummy Blogger could help me achieve. I can be my own Captain, on my own ship, sailing to my own destiny. From a young age we were told we could be whatever we wanted to be. I believed it blindly. To a certain extent this is true. However, if you love people and want a life involving them it can be hard to achieve. Not impossible no, but being whatever you want to be comes at a price. If I hadn’t had cared for people, namely my husband Michael, perhaps this could have been the case for me. I could have run off and sailed the world in search of my dream job. If I hadn’t wanted a family I could still be doing just that but none of the above is true. I like my family and enjoy seeing them, I love my husband and have done since before I can remember and I always knew I wanted to be a mum. For me, these relationships far outweighed any career choices I could have made. All of my decisions have been driven by the emotions I feel for the lovely people in my life. So far these choices have stood me in good stead and led me to this point in my life. I live round the corner from my Mum and Dad, I’m married to my love and we have just had our first baby. He is the reason why I have decided to do this now. This little bundle of love that has entered our lives has given me the extra motivation that has reignited my personal ambition. I don’t have lots to invest or a huge array of skills to delve in to something technical right away. Nor do I possess a vast amount of knowledge about social media and the blogging industry. So far I have learnt loads. What SEO is, what DA is, who prominent figures in the industry are, that Instagram, Youtube and Facebook all use algorithms to select, display and promote content. That there are such things as linkys, affiliate marketing and paid for links. That it’s better to be self-hosted than hosted and what that actually means. I’ve even learnt some very basic HTML codes which appeals to the linguist in me! Currently, I am feeling very determined to do my utmost as a Mummy Blogger and see where it gets me. Most of all, I’m enjoying myself creating something of my own. While Heath sleeps, I’m going to pour my heart and soul in to creating something for myself and my family. Whether it takes months or years, whether I do it alongside my current job or if it becomes a viable full-time option or if it simply remains a hobby, I am going to give this my all. I have so much to learn and so much to do. This is on top of having just become a first-time mum. I do believe it will be worth it. I’m telling you this because I have always been an over-sharer. I also feel that putting my goals and ambitions out there will help to make me more accountable for my progress. Further to this, maybe, just maybe, sharing my attempt at achieving my goals might inspire you to do the same. I’m intending on sharing my journey with you over the coming weeks and months! I will be recording all my statistics and reflecting on the actions I’ve taken regularly. Hopefully the things that I learn will be able to help others who want to do the same. If you’re already on this road please share your tips and tricks with me and I’ll be sure to do the same too! Stay tuned for my exploits on the road to becoming a verified Mummy Blogger!!! A site that has helped me to discover lots of things I didn’t know about is Aby Moore’s site and courses. Click here to find out more from the ‘youbabymemummy’ blogging expert. I still remember the excitement of starting my blog more than 3 years ago! Love that you have put your goals down so early on. I write my goals every year and last years were that I would quit my job which I did! So – you can totes do this! Look forward to following your journey. 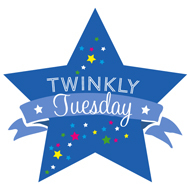 Thanks for linking up with #TwinklyTuesday (sorry I ended up commenting so late – babies huh!). How exciting to be at the start of your journey like that! I remember being the same over two years ago and now I can call it my job. I have friends that have given up teaching to blog full time as they have done so well! I love the name Heath too. 🙂 Thanks for linking up with the #bigpinklink this week. You’re already doing better than I was for my first year. I’m still totally rubbish at SEO! Thanks Jenny! You’ve won awards haven’t you? You can’t be that bad at SEO! congratulations by the way! Thank you! It’s so interesting, just so much to keep up with!